Ok, this is cool. I don't know this chip but I get it. What a cool platform for experimenting with roll your own effects. Any idea how the built in Chorus Flange & Reverb sound? If pin 13 had a toggle on it to select internal or external programs and there was a 3 bank dip switch for 16, 17, 18 for selecting the binary numbers of the banks, this would be awesome for experimenting with the internal programs and experimenting with roll your own effects. I'm a few projects behind but this looks like it could be super flexible. Added a version with switches. Thanks for that. I will be building this one. Built a PedalPCB Octagon with FV-1 and the effects are amazing and flawless. I built on of the octagon pedals .It's real nice. I added a rotary plus expression jack and can control the 3 control pots independently with an expression jack. Lug 2 of pot 1 to 1,3 and 4 on rotary. Pin 2, 7 and 12 to middle lug of expression jack. Take the 3v3 from lug 3 of the nearest pot to one of the outer lugs of the expression jack. Take ground from pin 1 from from same pot to other outer expression lug. Oops. Meant control 3-2 not 3-3 to rotary. I prefer a comfortable, realistic space between components. To be honest.. . I started building DIY effects to avoid digital mulieffects. Learning to mod, combine and improve analog devices is such great fun, unlike rebuilding digital chip-based ready units. But it's just me. The FV1 is a little different... You aren't limited to a handful of predesigned effects like some of the other digital modules over the years. Using the SpinASM language (or the visual SpinCAD tool) you can craft your own completely new effects, some that wouldn't be reasonable in the analog world. Want multiple delay paths feeding back into one another with each going through it's own independent effect? 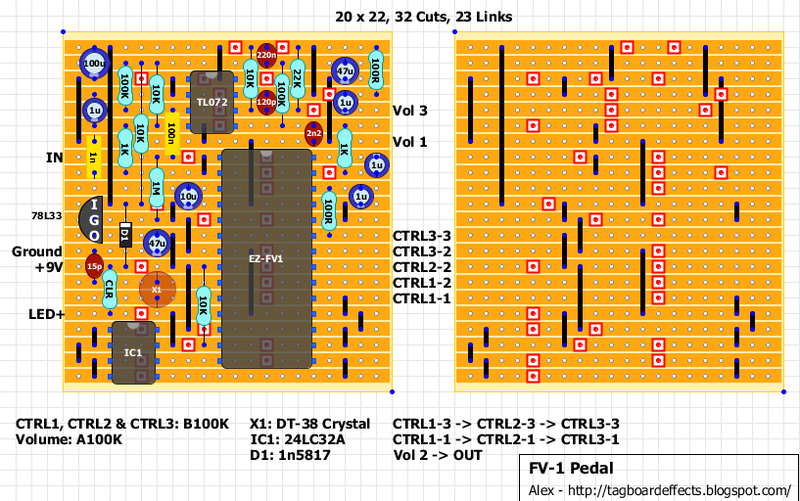 Maybe a bitcrushed "infinite" reverb with a resonant filter on the wet path? Or how about a pitch shifter that shifts up and down two octaves at the same time while applying varied envelope controlled modulation to each side? The control inputs don't have to be connected to pots... You can use an external LFO, an LDR, or even a PIC/AVR/Arduino microcontroller. There is a lot more fun to be had than just rebuilding precanned effects. 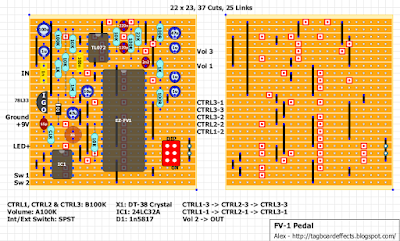 Just ordered three PCBs! Very cool stuff! The ThreeVerb on PedalPCB is pretty tasty. Super easy build even with the FV-1. 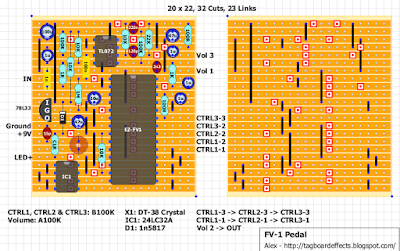 I recently put a reverb pcb and FV-1 kit order on the PedalPCB website. Extremely reasonable prices and shipping. Can't wait to build it. That module for selecting programs with the built in rotary switch is just great! Verified the experimental version. 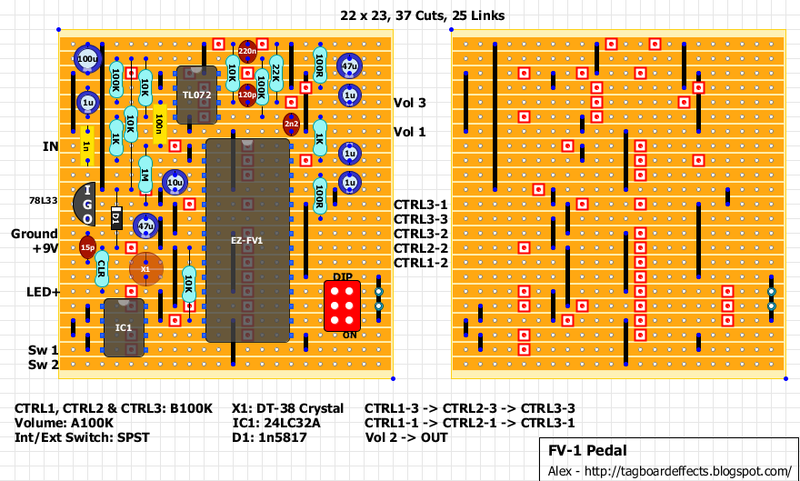 Used the only coded chip i have which is for the Octagon MultiFX from PedalPCB. It works quite well considering its not designed for it. Just get delay or reverb/tremelo effect. The DIP switch gives more subtle changes which i'm not to sure of yet. Thanks for the layout Alex. Pre=programmed EEPROM's available right now at PedalPCB! I'm curious about how to do ring mod with the FV-1. The spin website indicates that they treat it as really fast tremolo, but can it do signal multiplication like what is going on in LCM567 based ring mod?